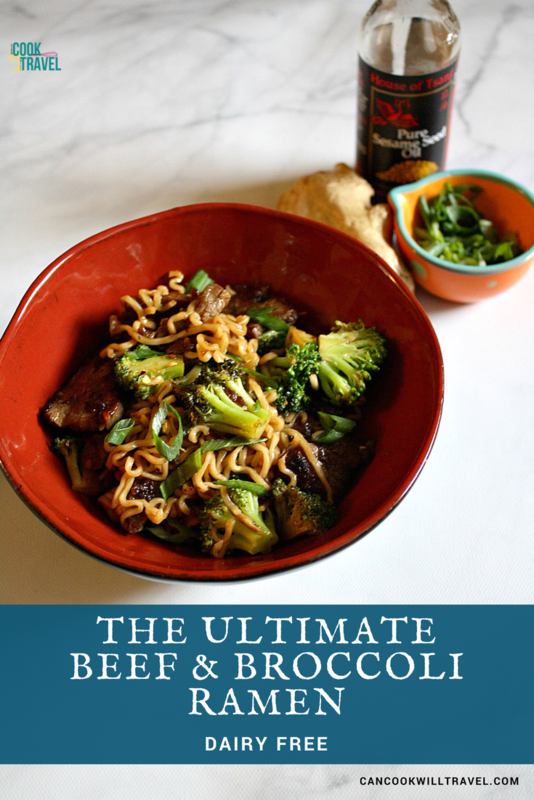 You are here: Home / Blog / Dairy Free / Beef and Broccoli Ramen For the Win! 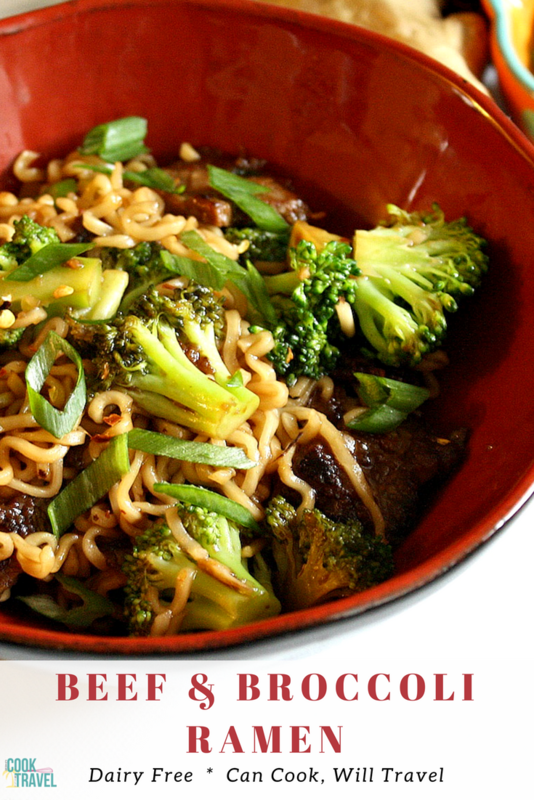 Beef and Broccoli Ramen For the Win! I’ve got a confession to make. I’m loving cooking Asian food right now, just in case you can’t tell from everything I’ve made this year. I’m pretty sure I could eat Chinese food or Sushi every day of my life (okay we’ll throw Italian in there too). One thing I always have on hand are ramen noodles, because it’s an easy way for me to get a quick meal with lots of greens. So when I spotted a Beef and Broccoli Ramen recipe on Pinterest, I pinned it immediately. As I started to review the recipe from Chelsea’s Messy Apron, I realized it was a bit too sweet for my taste. So I let that recipe inspire me and then I created my own crazy delicious Beef and Broccoli Ramen. It’s one of those recipes that you can partially make ahead, which I always love for a busy weeknight. First off you need a flank steak, which you want to thinly slice and cut into bite-sized pieces. Then you’ll marinate the steak in this crazy yummy sauce of peanut oil, soy sauce, honey, sesame oil, garlic, red wine vinegar, parsley, red pepper flakes, salt, and pepper. You can marinate the steak up to 12 hours. I only did mine couple of hours, but it was stellar! Then cook a couple packages of ramen noodles, and set the cooked noodles aside. Next you’ll cook the beef in a hot skillet. Since it’s thinly sliced, it’ll only take a couple of minutes total. You’ll remove the beef from the skillet, and then the sauce for the stir fry is cooked in that same pan. For the sauce it’s a combo on beef broth, soy sauce, sesame oil, a little brown sugar, hoisin sauce, ginger, and garlic. Then heat the sauce until it reduces. Once it reduces, add broccoli and pop the lid on so that the broccoli steams. Once the broccoli is done, add the beef and ramen to the pan. Toss it all together and serve it up. I topped mine with some green onions and red pepper flakes. Holy flavor explosion, this was insanely good. I don’t cook much with beef, which is a total shame. But seriously I know I’ll be making this one over and over, because it’s stellar. You have this rich, savory sauce that coats everything. The broth, soy sauce, and hoisin really add major complexity to the whole dish, and I promise you’ll want to go back for seconds and thirds. I particularly love the noodles in this dish, because they totally soak up the sauce, which is always a good thing. I’m a big fan of what sesame oil can do for a recipe, so I added it to the marinade, the sauce, and tossed the cooked noodles in it so they wouldn’t stick. Plus it ensures you get that awesome sesame flavor in every bite. 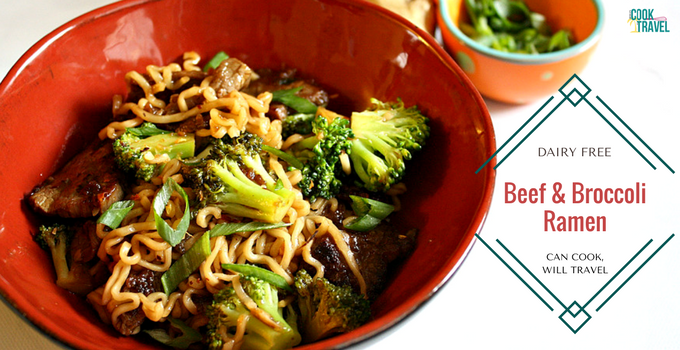 You’ll definitely need to make this Beef and Broccoli Ramen ASAP and I know you won’t regret it! Click that link for the recipe and step by step instructions, and happy stir frying!! One year ago: Baked Ravioli is Amazingly Easy & Delightful! Two years ago: Chia Peanut Butter Protein Balls Make Clean Eating Oh So Good! Three years ago: Quinoa Strikes Again with a Quinoa Berry Breakfast Bowl!